In today's hyper-dynamic business environment great services and customer experiences need to be knowledge-driven; they can?t be delivered purely through the performance of rigid processes and routine work. Your company?s ability to capture, share, develop and operationalise knowledge in a way that clearly ties into delivering effective services and experiences has rapidly become a very important factor in its ability to thrive. In the search to continue to improve customer experiences, we have to grasp the nettle of the work that doesn't easily fit into the mould of predictable procedures. 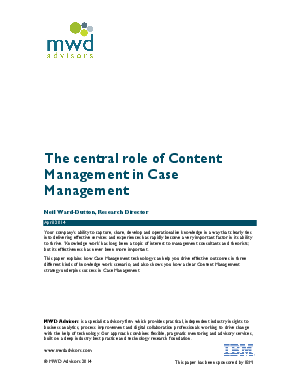 This is the kind of knowledge work that Case Management technologies are designed to help you address and improve.